We have always been surrounded by colour. But until recently there was little consideration to what is value might be. The question in childhood is often “What’s you favourite colour?” but today perhaps a better question is why do we like some colours more than others? How can we account for our colour preferences? Is it possible they say something about us? What is it that we recognise in colour? What can colour do for us? It is part of the same spectrum that includes, microwaves and X rays, radio waves and nuclear radiation. These waves can serve all kinds of purposes: boil water, carry information, even severely damage our physical body. Colour is not just a dance on the surface of things, it is part of the force of the universe. However it is subtle in its strength. It scarcely touches us physically, it is light, it has almost no mass. It is the resonance of the vibration of the colour wavelengths that seems to interact with our consciousness, stimulating us emotionally, mentally, spiritually. Colour interacts with our light field, our aura and chakras. The field of consciousness in which our thoughts, feelings and inspirations move. 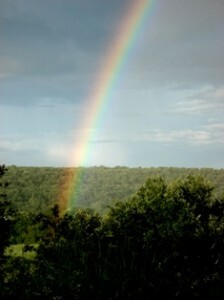 The rainbow provides a map of colour. The chakras of the aura mirrow the rainbow, mapping colour into our personal aura. Each colour affects different parts of our light field, stimulating different thoughts, feelings and impulses. For example the ruby glow of the red light district energises the base chakra and so stimulates sexual activity. My interest is to explore the resonances of colour within consciousness, both at the collective level of society and also at the personal level. I believe that ultimately we are beings of light and that colour is the fabric of our being.